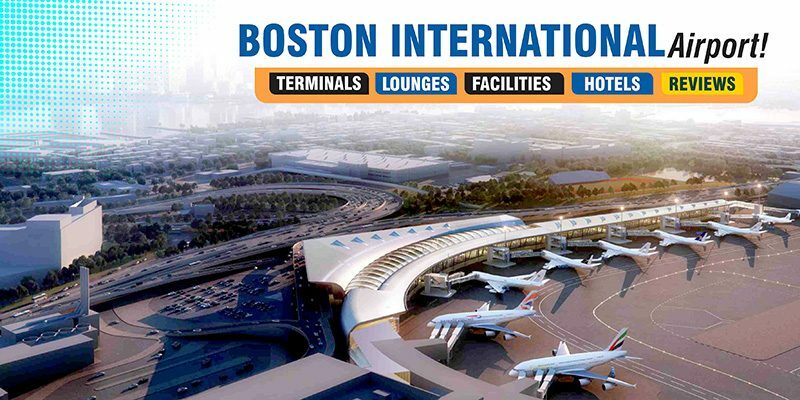 Boston International Airport is also known as Logan International Airport is an international airport in Boston (United States). Officially known by the name of General Edward Lawrence Logan International Airport, it covers 2,384 acres of area. The airport includes six runways and four passenger terminals. The name of the airport is taken from General Edward Lawrence Logan. The airport is 17th-busiest airport in the United States and has served a total of 33.5 million passengers in 2015. Airlines like Delta Air Lines and JetBlue carries out the largest operations from Logan International Airport. Other major carriers which operate their operations include American Airlines and United Airlines along with the daily transcontinental flights. It is also a destination for many major European airlines like Air New England, American Eagle, Braniff International Airways, etc. The airport serves its services to a number of destinations, including North America, Latin America, the North Atlantic region, Europe, Asia, and more. Boston International Airport code is ‘BOS’. There can be witnessed a rapid growth in international traffic and support new routes from the airlines like Air Europa, Avianca, Cathay Pacific, Emirates, Hainan Airlines, Japan Airlines, Qatar Airways, and others. This has turned Boston Logan into one of America’s fastest-growing airports. Logan International Airport has 102 gate positions which are divided among four terminals, A, B, C and E. It supports seamless connections between flights from different terminals. All terminals are connected by pre-security shuttle buses which make it easy to move through the different terminals. The terminal A at the airport was opened to passengers on March 16, 2005. Before that, there was a 1970s-era building designed by Minoru Yamasaki at the same spot. Being designed by Hellmuth, Obata, and Kassabaum; the terminal is divided into the main terminal and a satellite building. There is an underground walkway which connects the main terminal and the satellite building. The Terminal A was developed under a special facility lease between Massachusetts Port Authority and Delta Air Lines. It features two Delta Sky Clubs also; one of which is located on the third floor of the satellite building and the other one is opened at the site of the old Continental Airlines Presidents Club in the main terminal building. Talking about the terminal B, it was opened in 1974. Being designed by John Carl Warnecke & Associates and Desmond & Lord, Inc; the terminal remains unchanged until US Airways expanded its operations at Logan Airport in 1979. In 1980, Improvements took place with the help of HNTB. As a result, numerous small projects established until 2000. It includes passenger seating area improvements, concessions expansions, and passenger lounges. The terminal was opened in the year 1967. It was designed by Perry, Shaw, Hepburn, and Dean. The terminal comprises four groups of gates: C8-C10, C11–C21, C25–C36 and C40–C42. Along with that, there are two Terminal C security checkpoints also which provides access to Gates C11 through C21 on the left and Gates C25 to C36 on the right. In 2016, a post-security connection between Boston Airport Terminal C and Terminal E was opened as a part of renovations of Terminal C. It helps in providing seamless connections between the two terminals. In order to make all gates accessible through one common security checkpoint, Massport has plans to build a post-security connector between gates C8–C36 and C40–C42. The Boston Airport terminal E is also by the name of John A. It serves as the international terminal for Logan Airport and therefore houses all of Logan’s international arrivals. It is also known as the John A. Volpe International Terminal which is named after the former Governor of Massachusetts and U.S. Secretary of Transportation. Being designed by Kubitz & Papi, Inc. and Desmond & Lord, Inc; the terminal was completed in 1974. The overall project of “Terminal E Modernization” was completed in August 1997. This was initiated with a motive to improve the passenger facilities. Following are the list of hotels at Boston Airport which you can witness nearby airport. Passengers can get the glimpse of free Wi-Fi at the Boston Logan airport. All you need to do is to connect to the “Boingo Hotspot” network and you are free to use the internet facilities. For the comfort and relaxation of passengers, the airport also features permanent and rotating art exhibits which are on display throughout the airport. Passengers can find the cash machines and ATMs throughout the terminals. If you are traveling with a baby or infant, you can easily avail the baby care facilities at the airport. There is all the stuff like changing tables, power outlets, and fold-down chairs in the Mamava Nursing Suites. Family Restrooms are located throughout the airport. Have a seat in one of the rocking chairs located throughout the terminal and soothe a fussy baby easily. You will find three Kidports located airside. Passengers can avail the services of Travelex exchange counters which are available in all the 3 Terminals of the airport. A wide variety of retail shops and newsstands are available at the airport along with Duty-free shopping. At Airside: Au Bon Pain, Game On!, Legal Test Kitchen, Lucky’s, Fuddrucker’s, Fresh City, Starbucks, and many more. Passengers can find the Public Services Information Booth near Baggage Claim, on the Arrivals Level of every terminal. There is no proper storage facility available inside the airport. But, there is a luggage storage service called Package Express located in the South Station. You can find the mobile charging stations in many of the seating areas. Pet Relief areas are available at the airport in a designated area on the Arrivals level curb of every terminal. Passengers can easily get the services of Spa & Salon at Terminal C of the airport. Classique Salon offers unisex hair and nail services to travelers of all ages. You can avail services like facials, massages, and more at Be Relax, located in all three terminals. The nonstop bus service to and from Logan is available to the passengers. With direct service to all of Boston Logan’s terminals, it has full-service bus terminals. It would only take about 30-45 minutes and during peak travel periods, it may include some extra time. You can also avail the car rental services at the Logan Airport. It includes names like Alamo, Enterprise, National, Dollar, Budget, Thrifty and more. There are several area hotels provide airport transportation service as a courtesy to their guests. All you need to do is to check out the hotels which offer airport shuttle service. Taxis are available at the arrival area from each of the airport terminals. Reading other reviews I was preparing myself for the worst when arriving and departing from Logan. However, this turned out to be unfounded. We were off the plane and waiting on the silver line bus which takes you to downtown Boston for free within 10 minutes. Not many airports offer this perk. Departing was smooth, good food options at the airport to suit all budgets. There are a lot of seats available at the departure area. I will love to use this airport again. Since I live just outside of Boston, I always fly out of Logan. For those not used to big airports, there is no need to worry. Even though Logan is huge, it is quite easy to navigate and has great signage. Terminal C is for JetBlue and affiliates like Cape Air. Terminal B is Delta, United, and Air Canada. Terminal A is Southwest and AA. Terminal E is all international departures/ arrivals excluding Air Canada. The downsides are that it is usually busy and the Wi-Fi is hard to connect to. Boston rarely loses baggage anymore which is good. There are a plenty of food options and stores. The staff is very friendly and the overall environment is also calm. Including the fact that Boston is soon accepting A380s and B747-8, I truly recommend flying via Logan International. BOS-FCO Terminal E 29 July 2013. Check in was very fast. Security at the airport only took around 5-10 minutes. The departures level at Logan is very nice. There are many food options and facilities of your choice with many spectacular views of the planes gates and runways. A lot of seating nears all gates. Boarding to Rome took around 15 minutes. FCO-BOS Terminal E 22 August 2013. I arrived at Terminal E on time from our flight. When got to US Customs it was very busy but only a few desks were available. It took around 15-20 minutes. Then we see this big line of people in a zigzag line to get to the arrivals level. Many passengers were frustrated with the crazy line. It went by fast though and we finally exited to the Arrivals level. Was very clean and was happy to be back in Boston. ← Which Are The Top Airlines From USA To Pune For A First Time Traveler?